Priyanka joined Indxx in 2016. She heads Indxx's human resources and administration department and has been instrumental in developing and streamlining employee training, processes and policies at Indxx. 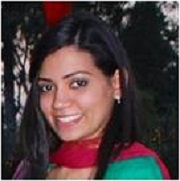 Priyanka started her career with PwC as a Transformation Analyst. She has a Masters in Human Resources from IMT Ghaziabad and a Bachelor's Degree from the Shri Ram College of Commerce, University of Delhi, India.